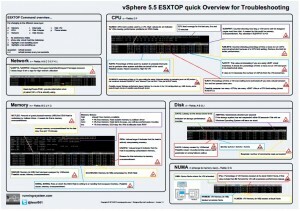 This diagram assists you in case of troubleshooting with the most frequently-used metrics and thresholds of the #1 troubleshooting tool for a VMWare Administrator – ESXTOP. It is provided as an A3 download, if you have eagle-eyes you can fit it to A4 when you print it. If you think that there is anything to add or to correct do not hesitate and let me know. And do not forget to check back frequently to running-system.com or better subscribe to the RSS feed to get the latest version.